Who Are Your Twitter Followers? Who Owns the Data Model? How Blind to Change are We? New Media Actionable? A Good Idea. Ready for Mobile Video Chat? In a cool move Amazon has bought the geeky surplus store Woot. Will operate as an independent subsidiary. Although I have not been there for a while Woot was known for its cheeky, self-deprecating copy that was by itself a fun read and follow. See, for example, their acquisition announcement. Congratulations to Woot for being acquired, worth a look again, as I plan to. Its only been five years since the launch of the Google Maps API. ReadWriteWeb celebrates with an article about it, and points to their map of mashups. Have now been involved with several applications that used Google maps, and the potential unleased for GIS applications is phenomenal. Take a look at some of the examples shown. In the Online WSJ: Wash Away Bad Hair Days - In the Lab as Procter & Gamble Tries to Figure Out Pantene, Fickle Shampoo Shoppers and Other Marketing Mysteries. ... Late in the article it is mentioned that they used neuromarketing techniques, specifically EEG biometric tests, to endorse and augment classical market research methods. At the end of the article a P&G researcher effectively endorses the use of neuromarketing biometric methods. First time I have seen that publicly done. Reexamining aspects of the interaction of work and play. Which brought me back to Stuart Brown's book: Play: How It Shapes the Brain, Opens the Imagination, and Invigorates the Soul, and his site and blog. I am a long-time student of innovation centers, helping found one myself, and remember hearing of Cargill working in this area a few years ago. Now they are finally under way. The description seems to be what one might expect. Much more on innovation centers in this blog. Want to know more? Contact me.
" ... Procter & Gamble has launched a major green-innovation campaign with a goal of selling $50 billion in sustainable products by 2012, says Len Sauers, P&G's vice president for global sustainability. To do that, the company has tasked its 9,000-strong R&D team with creating products that combine impeccable environmental chops with a strong mainstream appeal. "The key is to develop products that enable this mainstream market to be sustainable without any inherent trade-offs," Sauers says. "There can be no decrease in performance or increase in price." ... "
We tracked the idea of body scanning for some time, for product design applications like diapers. Its been seen in fitting Jeans and in some high fashion places. It does not seem to have taken off in general though. This article suggests it has advanced in some high value and precision areas, like in firefighting suits and sports uniforms. This does not seem like it should work, our reaction to 'free' as it is, but the article claims it does, to be seen how much they replicate this. In the CACM:, technical but interesting, The last sentence is telling, if you have to explain it, is it a good visualization? Yes, the underlying technology you are explaining can be complex, so that could be a reason ... Not otherwise. Heat maps are a unique and powerful way to visualize latency data. Explaining the results, however, is an ongoing challenge .... "
GigaOhm does a good job providing a case study of how to best understand your Twitter followers. This starts to answer a question I have had recently: Just who are these 500 people who follow me? Unless you block, or set up a restrictive follow policy, anyone can follow you. I often look at a follower's profile before I decide to re-follow. There are obvious answers: Common interests, Local Businesses, Want to sell me something etc. But what other characteristics do followers have? It turns out, because of the relatively open Twitter API, there are some tools you can use to find this out. Good case study.
" ... Andy Boyd talks about the myriad barriers that forecasters encounter in a corporate setting and how to overcome them in order to achieve forecasting's full potential. Michael Gilliland and Udo Sglavo list the "worst practices in business forecasting" to avoid. Jack Yurkiewicz helps to answer maybe the toughest question a forecaster can face: with so many forecasting software packages to choose from, which one is right for me? ... "
A cautionary tale about password use. Cory Doctorow gets Phished. “Here’s how I got fooled. . . . Phishing isn’t (just) about finding a person who is technically naive. It’s about attacking the seemingly impregnable defenses of the technically sophisticated until you find a single, incredibly unlikely, short-lived crack in the wall.” ... "
UPI article on the increasing use of private label by cost conscious consumers. Useful statistics.
" ... Nielsen and management consultancy McKinsey & Company have formed a joint venture to help clients improve their business performance through the use of intelligence drawn from social media sites. Nielsen’s BuzzMetrics buzz-tracking service becomes part of the new company, NM Incite, to which McKinsey will contribute expertise in the areas of marketing and sales, organisation and service operations ... "
I often quote the StoreFrontBacktalk site. Evan Schuman does a great job tracking the technologies that continue to change the world of retail and E-commerce. Read the site and add it to your list. You can also add your name to a newsletter there. Over the years I have learned much from it. Here are some recent posts in this blog that quote StoreFrontBackTalk. We are actively courting companies and always suggest that a good way to proceed is to build a prototype using their data to determine the value of the Xyggy technology. We are setup to turn around prototypes pretty quickly dependent on the data type. If any of your clients would be interested then we will be eager to help. I'll be pleased to discuss potential uses if that helps. Dinesh, ceo & founder, www.xyggy.com ... "
" ...Pepsi wants to get in on the ground floor of the next Foursquare. The marketer, which has been outspoken about its commitment to social media, crowdsourcing even its biggest marketing program through the Pepsi Refresh Project, is hooking up with a venture-capital firm to do just that ... " . Have not tried it yet but OCR conversions to text for Google documents is a nice addition. In particular for incoming faxes that I would like to store away and have them searchable. Don't know yet how well their OCR will work for faxes and copies. I also see a number of other updates have been made. A real SaaS challenge for Word? Colleague Aylin Koca of the TU/e Department of Industrial Design reports on the establishment of her startup: UXsuite. See some of her previous work posted on here on soft reliability. UXsuite helps in tracking and analyzing how complex connected products are used and experienced by diverse users around the globe on a day-to-day basis. Through real-time adaptation of usage and experience observation, UXsuite helps to automatically discover unforeseen interaction patterns. Automatic combined analysis of product usage and individual user experience patterns yields verified and continuous feedback on experiential design of products. Because users saying is not users doing; you need to know both! Based on such rich insights, it becomes possible to always position according to evolving customer needs at real-time ... "
In SASCOM a good report on Tom Davenport's Masterclass. Nicely done, though not too much more than an outlne. Recall that Davenport used our enterprise analytics work for a model in some of his books. His general view is that " ... most companies have massive amounts of data at their disposal, yet fail to utilise it in any meaningful way. But analytics is enabling firms to aggressively use their data in key business decisions and processes, with impressive results.... " . I agree. Today Tobii Technology globally launches the groundbreaking Tobii Glasses. These are the first mobile eye tracking glasses that assimilate a pair of normal glasses. This has been achieved by placing the eye tracking sensor behind the right eye and reflecting the eye tracking data off a hot mirror coating on the lens. This is a totally unique technology that creates unparalleled unobtrusiveness for mobile eye tracking! ... By Rasmus Pettersson, Product Manager at Tobii Technology AB ... "
" ... So how can something with that much influence be easy and unintimidating for a small-business owner to use? There's no need to be intimidated, blogger Christopher Bucholtz of Forecasting Clouds told the E-Commerce Times. Cost isn't really a major concern, either -- your major investment when adopting a social marketing strategy is time ... "
Geofencing is a kind of virtual alert system based on a geographical line or lines drawn on a map. So if you wanted to determine if a person entered a particular supermarket aisle, you would outline that aisle with a geofence, and as a person with a location-enabled smart device entered they could be tracked or credited with a visit. A loyalty count, but you don't need to check-in to anything. A big plus. It's about more than just getting close to something, its about crossing boundaries. Much more about the concept and recent thoughts about it in a recent Readwriteweb post. An simple but important concept in location based systems and geographical information systems. This blog in various forms was initially established to communicate to innovation center visitors starting around 2002. This blog's readers include executives and innovators of many kinds from retail, manufacturing, R&D, IT and beyond. From large companies to startups. I am now retired from the enterprise, but still very actively consulting. I am working with a number of companies as a board member, technical consultant, partner, innovator and guide. I can evaluate, write, advise and innovate in a number of areas. Always looking for new ways to collaborate. More about me can be found by Googling my name. Detailed data in LinkedIn. A short bio is here. Read this blog. If the areas I talk about are of interest to you, and can use my expertise, call me in the US at (513) 405 7387. More contact information in the left column of this blog. I Look forward to helping you. Heard Charlene Li talk today introducing concepts in her new book: Open Leadership: How Social Technology Can Change the Way You Lead. Some excellent points. In her blog she includes a post about the concept of an Openness Audit. Allows you to score yourself on how open your decision making process and organization is. I have not read the book yet, but looks like it is worth it. (My policy on books is that if you send me one I will mention it - and often review it. Otherwise it may or may not get reviewed in turn). Contact info in left column. I know there are still many organizations that are still debating the very value of social networks. This could help, especialy with their internal use. A number of good examples were shown. In Roger Dooley's Neuromarketing blog: Why Stories Sell. With some links to previous posts on the subject. Certainly they do sell, and are much more memorable than simple statements. Our brains have some special empathy for human scenarios. Advertisers have known it for a long time. Would like to see much more work on understanding how the brain works with stories. Discovered! An excellent site and scented spaces blog by Tracy Pepe on scent design. I am following, check it out. See also her recent post on CPG scent branding, a favorite topic of mine. A useful glossary of social media terms. Terms in play are always changing, worth knowing. In recent posts I have been exploring auction technologies, mobile and otherwise. Part of the exploration I did was to attend a local auction at Cowan's Auctions of the papers of Mary Lincoln. I got a number of emails about that, so thought I would include a link that talks about the results of that auction. Fascinating results. Barcode reading has been on my mind lately, see recent posts. And just as that occurs eBay buys RedLaser, with more than just code-reading on their mind. RedLaser is the best known barcode reading App, used by several shopping systems. I just reviewed Bing's remarkable move into this space. A CGT interview with Steve Knox, CEO of P&G's Tremor. " ... Have you ever wondered why consumers talk? Thought-leader Steve Knox shares tricks for building consumer advocacy for your brands through cognitive psychology ... "
Errors and omissions of the most ordinary and preventable kind kill thousands of patients every year in hospitals throughout the developed and developing worlds. A simple solution exists to this problem, argues Atul Gawande in his most recent book, The Checklist Manifesto: How to Get Things Right. A surgeon and a journalist, Gawande shows just how effective checklists can be to reduce the damage caused by human fallibility in industries including medicine, construction, aviation and others where the work environment depends on complicated processes, technology and equipment. So why aren't checklists used in every operating room and ICU? The answer is simple: In the existing medical establishment, too many doctors don't like to be told what to do. Add one more box to the checklist -- the need for cultural change.... "
I noticed in updates for the Bing IPhone App today that they were now allowing you to read barcodes and other images using a smartphone's camera. Then search for the items with the derived code. Smartphone barcode reading development is something I have followed for a number of years. I did a quick test of a number of items in the pantry that would be found on a typical store shelf. The read did very well, faster than most, in typical to medium dim light using an IPhone 3G, before autofocus. No audio feedback, which I would have liked. In a typical store it may be too difficult to see the thumbnail shown when the 2D code is read. What I liked very much was that the reader did what no other camera readers do, it quickly read the code upside down and even positioned at 90 degrees. This saves time when reading multiple items. Have not tried any of the other kinds of codes it claims it can do, like 2D codes and album images, but will. Nicely done. Most startup business plans I have encountered over the past few years mention that a side-effect of the business will be to create a software platform. The virtue of the software platform is that it will be capable of supporting the current business, and also create long-term value in delivering a foundation for developers outside the company to deliver products and enhancing a virtuous cycle of improvement .... "
" ... A shopper in a self-scan checkout line looks for the barcode on each product. Otherwise, those patches of fat and thin stripes that appear on everything from books to soup cans get little notice from the public. But barcodes are becoming more complex and useful. Newer ones may look like layers of stripes and numbers, or geometric shapes or dots that form patterns inside a square or rectangle. They hold much more information than their predecessors -- and that's creating new functions for codes in a variety of industries, and helping consumers to become better informed, shop more efficiently and save money. "From the checkout at your local store, to hospital wristbands and medicines to manufacturing environments and even the tiles on the Space Shuttle," said Steve Halliday, president of consulting firm High Tech Aid in Richland, "these relatively simple-looking black and white images continue to deliver incredible value." ... "
We saw DemandTec during their early days as a revenue management system. An impressive and sophisticated approach. Gigaom posts a good article on their work with Target.
" .. DemandTec, a retail-forecasting software provider, has convinced Target Corp. — an existing customer — to hand over even more of its shopping data in order to better set prices and forecast demand. Target is following a growing trend in retail that involves using more granular customer data to predict demand, thanks to advances in software and technology. But stores still need companies like DemandTec to help them turn the plentiful straw of digital data into predictive gold, a service that becomes more challenging as more data is introduced ... "
The use of scent was covered nicely in the current Business Week. I have mentioned a number of times our work in the innovation centers installing, testing and measuring the effect of using scent in retail. It's a powerful way to establish context in retail spaces. It works. It is an effective non-conscious trigger. Yet by its very nature it is harder to deliver and control. Particularly intriguing now is the ability to measure scent augmented conditions using neoromarketing biometric measures. Many more posts on scent here. The article is good because it further outlines a number of current retail applications of scent to define brands in contest. It also describes new programs in using scent as a strong element of design, beyond the fragrance world. Parsons New School for Design in NYC has launched a Masters degree which includes olfaction in design. Related post by Roger Dooley in his Neuromarketing blog and in Mind Hacks. Also notable is the work by Martin Lindstrom in using branded scent and work by Russell Brumfield. Both of these practitioners have implemented some very persuasive applications in this area. Male oriented housekeeping tips from P&G. I have taken a look at it, well done, it is a multi-contributor blog.
" ... Procter & Gamble has launched a household tips website for the growing number of American men who have become homemakers in a tough job market. The site, Manofthehouse.com, went live this month and offers the kind of advice on child-rearing, cleaning and cooking more often found in women's magazines. The site will eventually be used as a vehicle for advertising P&G's household and other brands, said Jeannie Tharrington, spokeswoman for Procter & Gamble Productions.The launch comes as the United States struggles to emerge from a downturn that hit men's jobs especially hard, according to U.S. Labor Department unemployment statistics... "
An article about P&G's involvement at the 2010 China Shanghai exposition, now ongoing. More about the expo here. This Forbes feature has received much publicity. Based on IRS data it is a dynamic visualization of US internal migration data. Simple and well done. by Brad M. Pruitt, M.D. .... " . A short but good overview article on the current delivery of health care via new tech, such as the use of Smartphones. See also my previous post on AI Physicians. StorefrontBackTalk reports that Mastercard is experimenting with a one time use password display. This approach has been used for access to secure resources for some time, but the card used was likely too expensive for general distribution. Also as a commenter asks, how would this be used in a restaurant, where the server leaves with the card? They could be given the one-time pin before leaving the table, or the process would need to be otherwise altered. From CACM: NASA ends plan to put man back on the moon. In Mindhacks: Information about IBM's Watson system, which is designed to analyze and answer natural language queries. Also points to a NYT article on the topic, which is worth a read. A long-time artificial intelligence challenge. We saw it demonstrated for relatively simple database queries. Have not seen it for a number of years, but it has apparently improved considerably. I would like to see a comparison to the natural language capabilities of WolframAlpha. They are using it for Jeopardy game challenges. Natural Language remains a tough problem, not completely solved. Yet would it not be nice to communicate with machines in simple natural language, typed or spoken? IBM's site and the Watson system in WP. Thoughts on becoming a design leader, by David Sherwin. Nicely put. In the Design Mind blog. Giant Screen social games at events, via Springwise. Why not done remotely as well? I saw a simpler example on the Lake Geneva fountain a number of years ago.
" ... SUNSPOTS come and go, but recently they have mostly gone. For centuries, astronomers have recorded when these dark blemishes on the solar surface emerge, only for them to fade away again after a few days, weeks or months. Thanks to their efforts, we know that sunspot numbers ebb and flow in cycles lasting about 11 years. But for the past two years, the sunspots have mostly been missing. Their absence, the most prolonged for nearly a hundred years, has taken even seasoned sun watchers by surprise. "This is solar behaviour we haven't seen in living memory," says David Hathaway, a physicist at NASA's Marshall Space Flight Center in Huntsville, Alabama.... "
From a paper by Cees Snoek and Arnold Smeulders of the University of Amsterdam, suggests that the machine understanding of images is within reach. Minimal abstract here. Good paper which addresses semantic issues of the problem. Well known tough problem that I have followed for a number of organizations. Had heard of this before but only briefly... a novel idea which uses a barge on tributaries of the Amazon river in Brazil to engage truly emerging markets. Much more in Bloomberg. From Saffron. Intriguing linkage of associative memory and visualization. Will examine it more closely. McLean, VA & Cary, NC, May 19, 2010 –- Centrifuge Systems, Inc., a leading provider of next-generation Business Intelligence (BI) software, and Saffron Technology, Inc., a data analytics software firm providing associative–memory-based Experience Management solutions, today jointly announced they are partnering to deliver a graphical, highly interactive streaming data analytics and Business Intelligence solution for enterprises worldwide. Both Saffron and Centrifuge were recently recognized as “Cool Vendors” by a leading analyst firm. The integrated solution combines Saffron Natural Intelligence Platform Version 8.0 and Centrifuge 2.0. The offering gives customers in business and government the ability to apply associative memory to analytics and business intelligence — both via Saffron’s sense-making and decision support capabilities, and Centrifuge’s powerful visualization solutions ... "
MUNICH / ESSEN, June 17th, 2010 - Are you trying to find your way around a huge indoor event such as a trade fair or a large museum exposition? The KIOSK EUROPE EXPO 2010 Channel is the first real life implementation of junaio®`s advanced indoor navigation capabilities on your smartphone, presenting an interactive mobile guide to the world`s largest trade fair on electronic self-service and innovative retail solutions. junaio® is the first augmented reality platform to overcome the accuracy limitations of GPS navigation, offering pinpoint indoor navigation services. Point, click and view information on individual exhibits or find directions to interesting events and locations. Available for iPhone and Android ... find a movie here: http://www.youtube.com/watch?v=jRcSFXvoPkU ... "
First of its kind program in the US. Useful to see this kind of thing happening, and I hope it is linked strongly to MBA programs there and elsewhere. Update from the Comments: Another, perhaps earlier program at NC State. Part of the problem here may be the defintion of predictive analytics. All forecasting methods are predictive analytics, done using modern methods since the 40s. Google Scholar, which we found useful in the enterprise a few times, has added a blog which details recent changes. Including the ability to set alerts for new research. Good article on SPSS, SAS and R by Steve Miller. I have worked now with all three of these packages over the years. They are all fundamentally good packages, with specialties and capabilities varying. In the enterprise all three were there. In the startup environment more attention is paid to cheaper solutions, so the focus changes for typical statistics. I am also concerned that some capabilities have been repackaged and now are being resold and packaged as 'predictive analytics'. In particular the way SPSS's former Clementine package is being re-sold at prices too high for the startup environment. Good article on neuromarketing in Visibility Magazine. Makes the case that these techniques should be added to your marketing toolbox. Especially here regarding Search Engine Optimization (SEO). An intriguing challenge. With increasing numbers of onboard sensors, the possibilities abound. Especially considering that your could connect to a real MD through a videoconference, as needed. It is certainly a way to get any kind of expertise where is is not readily available. Less confident about the Artificial intelligence aspect of this, you still cannot put too much confidence in the 'intelligence' aspect of this idea.
" .... When we released Version 6 in May 2007, Mathematica was reinvented. We also reinvented something else that Mathematica has long been known for: its extensive and detailed product documentation. While some appreciated the recrafting of our tutorial content as stand-alone electronic documents, others missed the narrative of the book, and let us know it. Which is a good thing, because it led to the creation of the Wolfram Mathematica Tutorial Collection ... "
Dave Knox reports: " ... At this year’s CM Summit, Mary Meeker shared an updated presentation on her 2010 Internet Trends. As always, Meeker’s presentation was jammed with thought provoking statements and facts that every marketing professional needs to pay attention. In particular,the following caught my eye as things every Brand Manger and Marketer needs to keep in mind ... "
Word of mouth is always an interesting topic. The office watercooler is a symbol of that connectivity. An Adage article on the continuing reign of TV over Internet as the starting point for conversations. Hardly unexpected. How long will it last?
" ... Last week in Santa Clara, California, luminaries from the augmented reality (AR) industry gathered for Augmented Reality Event 2010 - a conference focused on the business of AR. The two-day event was a great success filled with eye-opening sessions about AR and its possibilities for the future. Fortunately I had the chance to sit down one-on-one with two of the biggest names in the space - leaders of the pair of companies some refer to as "the titans of AR." .... "
The location based location activity-game Foursquare has developed a base of both lovers of the concept and haters. I have tested it for some time now. This CW article gives a good overview of its progress and a number of businesses testing the waters with it now. It also suggests that we will all be using it, or something very like it, soon. I don't find the gaming aspect of it very interesting. Yet the loyalty and promotion-focusing potential of such systems are real. Companies are likely to provide better incentives to customers that engage by really being there. Alex Petrilli – Manager, Audience Research, TiVo Inc. and Elissa Lee – Vice President, Research and ARM Product Management, TiVo Inc. According to TiVo’s Stop Watch data, 41% of all programs were time-shifted during the four quarter of 2009, allowing viewers to fast-forward through the commercials. To combat this dilemma of viewer-controlled programming, marketers are experimenting with a cadre of advertising innovations such as pod busters, limited commercials content and advertisements thematically tied to the program, with varying degrees of success. Discover which of these innovations are the most successful, as DVR penetration moves toward fifty percent and beyond. Ad Age piece on the trends on laundry solutions around the world. An old interest of mine from research within the enterprise. In Junk Charts: Oil Spills Bring out the Worst. A number of examples that just muddy up the data they are trying to deliver. I get the feeling that news organizations are trying to develop images that can be readily noticed for being different. But when you try to extract the actual data relationships they just become confusing. Colleague Sammy Haroon posts on Culture and Consumer Choices. Tomorrow (Tuesday 15th June) is GS1 MobileCom Day! Local conferences, workshops and demos are taking place in over 35 countries worldwide. You can participate by joining one of 3 global webinars. To register, just visit http://www.gs1.org/mobilecomday2010. Asia-Pacific Webinar: IBM: "The Smarter Shopper" / SAP: "Mobile and retail"
Europe/MEMA Webinar: L'Oréal: “The mobile consumer” / Deloitte: "Informing Shoppers"
Europe/Americas Webinar: Kraft: 'iFood App" / Ogilvy: "Advertising 2020" ... "
How much should social network based strategies depend on data from the behavior of those sites? Evan Schuman writes about this in StoreFrontBacktalk. Most social sites have been around for a relatively short time and they are constantly changing their strategies. If the strategy is successful then it is likely that a site like Facebook will maintain the data to induce others to play the same way. And such strategies themselves are short-lived. In Slashdot: Another look at the disagreement between the two Harvard associated thinkers Steven Pinker and David Carr. Does the availability of the Internet hurt or help our thinking? And is this also an argument about neuroplasticity, ... whether the human brain is fundamentally adaptable or genetically locked into patterns of behavior ... ? This does call for a debate, which I am sure is being worked. This topic recently came up in a conversation and this post addresses it. From Information Management. Always interesting Steven Pinker writes an opinion piece in the NYT entitled Mind over Mass Media. ' ... NEW forms of media have always caused moral panics: the printing press, newspapers, paperbacks and television were all once denounced as threats to their consumers’ brainpower and moral fiber ... '. Well put piece that challanges other recent work that suggests the shallowing of our minds. From the BBC, via Richard James. A good piece about how neuroscience and artificial intelligence have been exploring how our filters work and don't work when we want to explore complexity in our world. Based on messages received I know that some of you have been following my auction technology thread. I wrote about the Cowan auction of Lincoln history. That auction completed today, and the lot that included the Mary Todd Lincoln commitment papers sold for 32,500 US Dollars. It had been estimated to sell at between $8-10K. For more about upcoming Cowan US history auctions, see their site. Does this mean the commoditization of higher education? Once you have lots of training courses online, and a way to rate them AND a means to pay the teachers, will formal classrooms just go away? How much does software add to the cost of today's vehicles? How about tomorrow's electric cars? 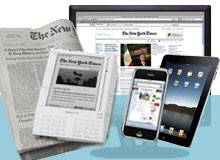 Special report from Knowledge@Wharton: Turn the Page: What's Next for Publishing?. Excellent. Mark Montgomery of Kyields's blog post on the Gulf spill and the need for polymath perspective/philosophy for overcoming challenges. Computerworld looks at some of the early prototypes of laptops from a number of vendors. Most of what we see are multiple screens that can be used independently. Not really very novel at all. Flexible screens, where you could roll up your laptop in a scroll and carry it along are still some time away. Or pull a screen out like a window shade. Screens can be made flexible, but all the other parts are still hard to embed readily. I still like the idea of a laptop that would be all projector, then could utilize any flat light surface at hand. In Technology Review: Text analytics method that picks stocks better than the pros. Which pro? Any pros? I have seen such methodologies of various stripes. My questions are always: In which kinds of markets? And why would you be telling me this? The text methods are interesting ... anything that can convert unstructured data to useful structured quantitative results is worthwhile. Second Life, the well known virtual world that attracted large investments in time and money from companies like IBM, Kraft and Circuit City, announced a 30% downsizing. In addition they plan to make major changes in their interface that will make it browser based. Our enterprise built a life-like central office there for experimental purposes. I saw dozens of IBM employees building research, laboratory and meeting spaces. Witnessed the opening of a virtual supermarket being built and experienced its aisles. I interviewed a number of researchers working there. I was particularly intrigued with some experiments underway that would allow people to experience complex data in novel 3D ways. Yet there seemed to be few useful business experiences happening and graphically impressive but empty mock ups of real spaces. The well known Second Life economy did not lend itself to consumer goods experiments. It is certainly not dead yet, but its demise may be close by. The avatar centric 3D world has evolved remarkably since I examined it five years ago. Something like it may eventually be a new way that we interact remotely with people and machines. Its not ready for business prime time yet. Many did and do enjoy it as life-mimicking game environment. It still claims to be profitable. There are alternatives than can be used for complex remote business interactions by people, such as Teleplace (formerly called Qwaq) that is worth examining, providing ' virtual spaces for real work ... ' ... I have posted some of my early thoughts on it here. June 9, 2010 - More than 200 consumer goods executives convened yesterday for the kickoff of the 2010 Consumer Goods Sales & Marketing Summit at The Roosevelt Hotel in NYC. In its seventh year, the event has one aim in mind: to provide attendees with more insight into hot topics, like effective retail partnerships, marketing investments, promotions and brand penetration, through its thought-provoking agenda and abundant networking opportunities ... " Read the rest through the link above. Mindhacks on the power of fictional plots and stories. Beyond that they are working with global CPG company Unilever.
' ... In my previous post , I discussed the forces behind what I’m calling The Data Singularity. My basic thesis is that as information generating processes become more frictionless — as humans have been excised from information read-write loops — the velocity and volume of data in the world is increasing, and at an exponential rate. But where we go from here? What are the consequences of living in an age where every datum is stored? Where are the bottlenecks, pain points, and opportunities? Which technologies are addressing these? ... '. Good article with some prescriptive thoughts about the topic as it addresses the challenge of economic changes to CPG companies, especially aspects like the increase in private label buying. The analytics and data availability is driving these new ideas. A newly discovered drawing system called Mypaint for freehand images, does not make you a graphics artist, but a nice start. Via Downloadsquad. Is the IPhone in trouble because its business model is not open enough? You can build some clever things that win at first, but will they survive when challenged by more adaptive solutions? This blog has a number of times covered auction technologies. This resulted from a number of studies of auction processes inside the enterprise. Recently I have had some conversations with the impressive local Cowan's Auctions on semantic taxonomies. I am also very interested in American History. This Friday, June 11, the commitment papers of Mary Todd Lincoln will be auctioned at Cowans. You can attend the auction in Cincinnati, or participate online or by phone. An article on the history of this item here. Open to the public. Along with a broad variety of fascinating other American History items. To see the richly detailed catalog of this auction, go to the Cowans site and click on the current auction catalog. The Mary Todd Lincoln papers are in lot #296. You can also register there for updates, or to bid online. The site also contains a database of thousands of items sold. Former P&Ger Randall Beard in his Marketing with Impact Blog about digitization of the first-moment-of-truth, the interaction of shopper and store at the shelf. Also known as merchandising. The topic is a frequent one in this blog. He does a good job providing an overview of the topic, connecting it to P&G practices and mentioning a number of vendors currently in play. Worth following. Via Stan Dyck. How much does the ready and easy availability of video chat add to the value of business communications? Some rumors that this will be the new ingredient in the IPhone hardware and operating system. A Computerworld debate on the topic. I am of the opinion that while sharing screens can add much to business interactions, an actual visual of the person's face does little. Of course I can remember debating whether color screens provided any value for a PC. It's very ubiquity may provide new dimensions to business connections. We met MIT's Neil Gershenfeld and read his book: When Things Start to Think. Much enjoyed, but I did wonder about how hard it would be to implement what he was suggesting. Remote manufacturing perhaps, but machine replication? Here is a New Scientist article that discusses progress in this area. A true rise of the replicators? The implications? Walter Riker writes about Reporting vs Blogging in his Ease of Blogging blog. Walter's blog is a great resource in this space, and he is also a first rate teacher if you are new to starting a blog. We often talk about related issues. Via Walter Riker: Sony demonstrates lifelogging glasses. Have been looking at eyetracking approaches lately. In the Enterprise we examined related methods for delivering key knowledge to people as they performed support requiring tasks. As their design improves you could pay consumers to wear them to track their behavior engaging your product in the real world. Out there, but not that far away. Richard Herschel looks at the various definitions of BI and tries to make sense of how it relates to the objectives we should be seeking. Well done.
' ... Business intelligence is the application of data, technology, and analytics to gain insight and knowledge that enables decisions about people, processes, products, and services that yield positive economic outcomes. A discussion of whether including links in writing is a good idea. Have always thought the very purpose of being on the web is to include links to supporting material. But does it distract you from the point being made? The goal of visualization is to aid our understanding of data by leveraging the human visual system's highly tuned ability to see patterns, spot trends, and identify outliers. Well-designed visual representations can replace cognitive calculations with simple perceptual inferences and improve comprehension, memory, and decision making. By making data more accessible and appealing, visual representations may also help engage more diverse audiences in exploration and analysis. 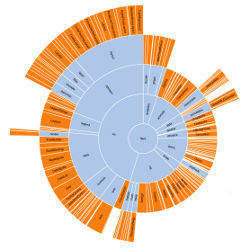 The challenge is to create effective and engaging visualizations that are appropriate to the data ... ' . I like this, but I repeat ... keep it simple when you visualize! Once more I would like to suggest that you take a look at Zakta. Constructed by some very smart developers I know. Its been updated now a number of times. An alternative search engine that allows you to do all the usual things with search, but also seek out focused expertise in the form of 'Guides'. In addition, it sorts out the results of a search into alternate forms to make them easier to use. This is well worth a look as it evolves. Some great examples of medical augmented reality in ReadWriteWeb. Via obdervant colleague Stan Dyck. It brings up the interesting idea of using AR to highlight data and its implications are demonstrated. In the case of data visualization I am also always concerned that augmenting results can also misrepresent results. Though I much like the idea of using augmentation to highlight important relationships for training and alerting. A short piece about a company emitting the scent of a steak from a billboard. At the Innovation Centers we experimented extensively with targeted in-store scent delivery. The company involved is ScentAir, who we worked with. They also feature this project on their site. This is an example of a large scale delivery that probably does not need careful control of scent delivery. Different than in-store. More on this in ScentAir's Blog. An obvious but still rare play in the world of loyalty. Is this the way that loyalty programs will evolve?
" ... Wal-Mart warehouse chain Sam's Club has introduced eValues, which offers discounts based on each consumer's shopping history. The program, available only to "Plus" members, allows users to view deals on the Sam's Club website, via e-mail or at store kiosks, with savings applied automatically at checkout ... "
Good overview post on Wal-Mart's supply chain practices from Evan Schuman's StoreFrontBacktalk. Some interesting new methodologies being debated by Google. Recognition of images is an area I have worked on for a number of years. P&G is involved in a widespread rollout of understanding non-conscious consumer behavior: " ... Procter & Gamble has partnered with Swedish eye tracking technology firm Tobii Technology to do package and shelf testing on a worldwide basis, according to a report from the Market Research Industry Online ... '. I just reviewed two emails I received about some technology areas I cover. Neither contained a link to the press release content I could send on. I had to ask the company for the links. Brainless. Silicon Valley Watcher posts about this behavior. "Embedded Analytics and Business Rules: The Holy Grail? The effective combination of embedded analytics and business rules can pave the way for all kinds of valuable automation. Examples include next best offer which can boost sales; better fraud detection, which can limit losses; lower inventory, which can streamline operations and thus also lower costs; the list goes on. Tune into this episode of DM Radio to learn how, where, when and why to combine business rules with embedded analytics. We'll hear from Boris Evelson, Forrester; Dean Abbott, Abbott Analytics; Drew Rockwell, Martin Dawes Analytics and Mike Lees, Software AG.... "
During a period when many enterprises were thinking about how to build expert systems that might augment human beings, we learned about the concept of tacit knowledge. It was quickly discovered that while experts knew how to solve tough problems, formalizing that knowledge so that machines might use it was much more difficult. This article does a good job of explaining the concept. This is also well covered in Nonaka and Takeuchi's book The Knowledge Creating Company. Colleague Sammy Haroon does a good job writing about new business models for innovation in emerging markets. Making good use of a recent Economist report on the subject. Sammy has some excellent close-up experience in this area and is worth listening to. From a press release by Metaio. The concept is something I have been looking at in a number of forms for years. Combining physical spaces with realities that can then be augmented or modified to match shopper needs. We experimented with this in virtual reality spaces and in our innovation centers. Contact me if you would like to discuss this insight. This was before smartphones could deliver the capabilities directly to the hands of the shoppers. Great idea, but how it works depends largely on how it can and is delivered. Smartphones, if they are not there today to technically provide this promise, they soon will be. So it is a good time to see this happen. 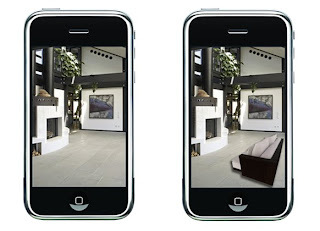 Metaio and YOUReality Bring Augmented Reality to E-Commerce (This link contains more details, images and videos) ... The Internet changed how people shop. Now, YOUReality LLC and metaio Inc. are changing how people will shop online. With the introduction of its Online Retail Visualization 3D tool, YOUReality is making it possible for consumers to see products in their own space before they purchase them by integrating Augmented Reality into a suite of commerce applications. The new services allow shoppers to make more confident buying decisions, deliver retailers a higher sales conversion rate, and significantly lower product return costs. Online shopping is attractive to an increasing number of consumers for its convenience, speed, product selection and other benefits. To make the shopping experience even more engaging and informative, many retailers are enhancing their websites with multimedia features such as video clips, virtual visualization or slide shows so that shoppers can better understand product features. An interview with P&G's Melanie Healey on Invading 'Whitespace' via Innovation, in Brandweek. Nothing very new, but good view of their directions. Dan Ariely's new book, The Upside of Irrationality is out. See more at his blog. On the list here. A number of posts about the invention of the amplifier by Lee De Forest in 1906. A crucial step in the broad application of electronics. As the Gizmodo article indicates, he is rarely membered today. Gizmodo quotes from Nick Carr's new book, The Shallows. Like Tesla he made little from his remarkable inventions and died relatively poor.